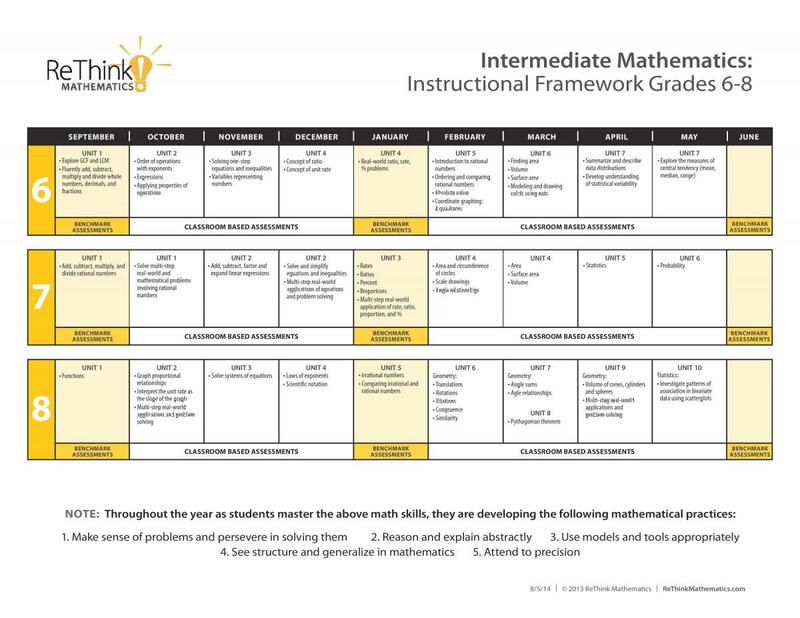 ReThink Mathematics’ Instructional Units were developed to help schools align all K-8 math teachers toward one uniform scope and sequence regardless of the classroom textbook or the needs of the students. All instructional units can be mapped to schools’ existing textbooks and all units accommodate remediation and enrichment at each grade level to promote mastery of the standards. Go to ReThink Store to purchase! Snapshot Overview of Content Standards: This one page overview guides teachers on what critical standards all students should master by the end of the year. 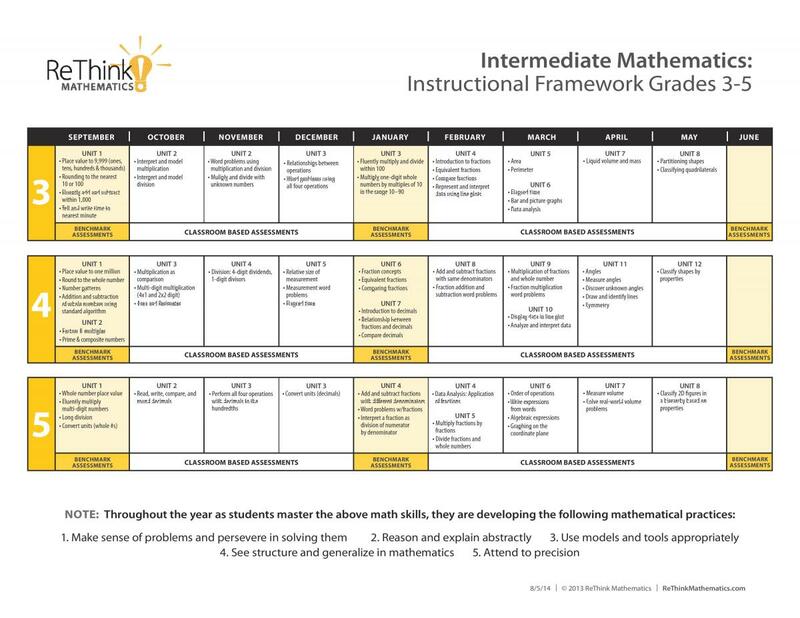 ReThink Mathematics includes previous grade level standards, as it is imperative that students do not have any gaps in their math learning. Year-at-a-Glance: The grade level Year-at-a-Glance provides a “general” pacing timeline to move through the instructional units. The pacing is always adapted to meet the needs of the students in the math classroom that school year. Many teachers find it empowering to break the textbook habit of one lesson per day. ReThink Mathematics loves to see when teachers experience the “Aha!” moment when the standards guide them, not the textbook! Unit Focus: Each unit includes a unit focus, which provides the teachers with the content standards, key concepts, and vocabulary terms taught in the unit. 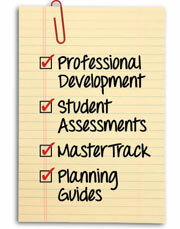 The planning units also provide an alignment of the standards for mathematical practices. ReThink Mathematics aligns classroom textbooks to our own instructional units as a service. Unit Resources: Activities, games, and websites that teachers can use to teach the unit standards are found here. ReThink Mathematics is always developing new activities and provides additional updates to the “teacher resources” section of our website. Unit Parent Letter: ReThink Mathematics has found it helps to keep parents aware of the standards being taught in each unit as well as the ones that should already be mastered. ReThink Mathematics developed a parent letter to send home at the beginning of each unit providing additional web-based resources, activities and games to reinforce the math standards at home. Problem Solving: The problem solving section includes tools, strategies, and math problems to support teachers incorporating “Problem Solving Fridays in their weekly routine. Enrichment: The enrichment section includes a bank of enrichment activities to use with students who have shown mastery on the standards. Websites: This section includes a vast resource of websites to support educators teaching and assessing the Core math standards. 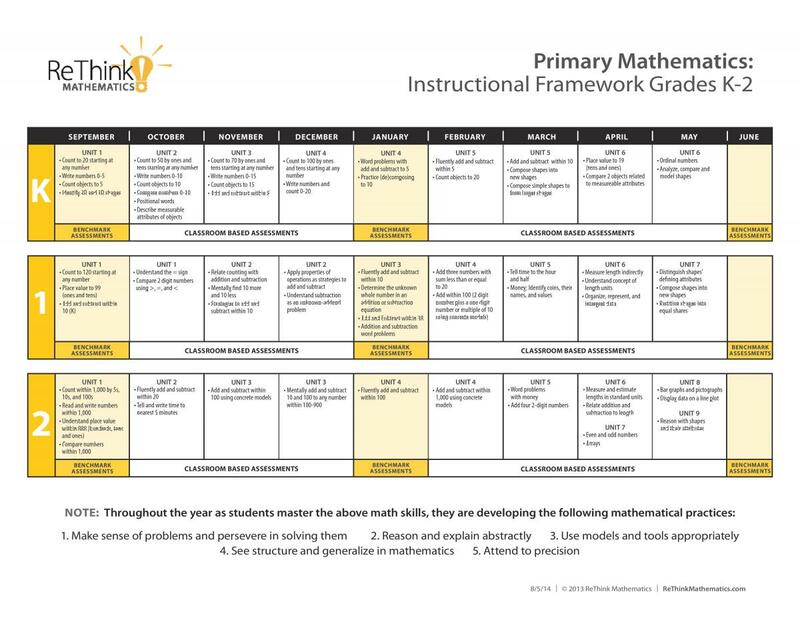 Instructional Framework Progression, K-8: This instructional framework visual allows teachers to easily see the CCSS-M progression of all K-8 grade levels.